Adobe has merged two of its app development services into one in an attempt to help businesses easily build professional-looking apps, without requiring a whole lot of coding know-how. The Digital Publishing Solution and Adobe Experience Manager Apps components of the company’s Marketing Cloud services are now under one Adobe Experience Manager Mobile umbrella. Using the new-ish service, teams inside a business can work together to build a snazzy-looking application without requiring a whole lot of code. Experience Manager Mobile is designed to allow a designer to create a rich canvas with which to display content that includes assets from Creative Cloud applications like Photoshop and Illustrator. After that, a marketer can update the app’s content without needing code and the two of them can have the flexibility to call in a developer to create custom code for the resulting app. With the launch of this particular service, developers can also connect those apps to critical business systems like CRM, ERP and product information management software. What’s more, the final product can be published to the Android and iOS app stores, so businesses can distribute the resulting app to the public. It can also be distributed privately as an application binary, for companies that just want to keep it inside the firewall, or share with a select network of partners. Administrators will be able to oversee the applications from a unified dashboard, meaning that IT departments can leave development of these applications to employees, but still be able to keep an eye on and manage them if a problem arises. Companies that are already using Adobe Content Manager Sites and Assets as a content management system can also use those existing tools to help build out applications using Experience Manager Mobile. Apps built with Experience Manager Mobile also integrate with the rest of Adobe’s Marketing Cloud, which means that businesses can actually track the usage statistics of their internal applications, just like they would an external app build with other tools. In some ways, it’s similar to what other companies like Microsoft and SkyGiraffe are doing with their respective enterprise app creation platforms. But those products are really aimed at empowering everyday employees to easily create lightweight applications that might not look the best, but let them easily push data from line of business applications out to coworkers’ mobile devices. Experience Manager Mobile is designed to create richer, more full-featured apps, but at the cost of requiring more people with specialized skills get involved with creating the application itself. 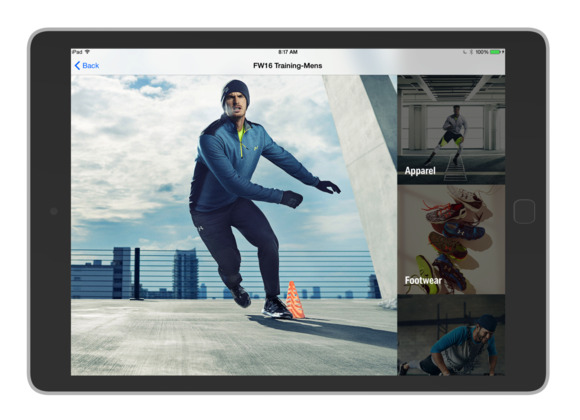 It’s a trade-off that has benefited companies like Under Armour, which created a virtual catalog application for its sales force using Experience Manager Mobile.